No doubt about it: It’s hard for a girl to lead a normal life when she’s surrounded by vampires and shape-shifting Weres. Telepathic cocktail waitress Sookie Stackhouse has a long and unsatisfactory romantic history with vampires. Her latest honey is the magnificent were-tiger Quinn, who arranges ceremonies for the vamps. Sookie is taken away from the witch she’s rooming with in her quiet Louisiana town by her commitment to attend the vampire summit in Rhodes as a telepath for the Queen of Louisiana, whose power has been diminished by Hurricane Katrina and the murder of her husband, the King of Arkansas. She travels on the vampire airline with the Queen’s retinue, which to her dismay includes Bill and Eric, two of her vampire ex-boyfriends. Arriving at the exotic vampire hotel, they find it picketed by a hate group. Sookie is instantly immersed in the intrigue that develops when the Queen fights the murder charge and plots to bolster her position in the vampire community. Because Sookie’s gift allows her to pick up on human thoughts, she has some helpful suggestions for the Queen, whose prospects improve after her accusers are found dead. Although Sookie eventually cuts through confusion to resolution, her own life is left in disarray. 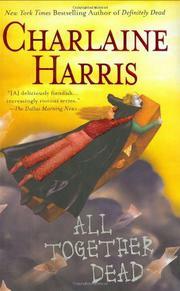 Harris’s vampire series (Dead as a Doornail, 2005, etc.) is slated to become an HBO program that will presumably prune the excess verbiage that competes here with scores of fascinating characters.